Laurie Here - Contemporary Fiction and MORE - Book Reviews: "Spooktacular Giveaway Hop!" 10-24 to 10-31-12! Come see what books I am giving away! 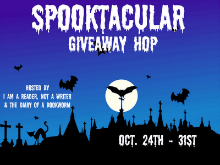 "Spooktacular Giveaway Hop!" 10-24 to 10-31-12! Come see what books I am giving away! HUGE thanks to our Sponsors, I Am A Reader, Not A Writer and The Diary of a Bookworm! Thank you!!! To ENTER this Giveaway, please click - - HERE - - ! Have FUN hopping! There are ALMOST 500 OTHER BLOGS that are participating in this hop! WOW!!! This is the BIGGEST Hop of the year AND THE BIGGEST I HAVE 'EVER' SEEN! WOW!! !